What with it being Lent and everything my mind has turned to sweets. This is a throwback to my childhood when every Lent I would struggle through my 'giving up sweets' decision until Easter came around and I could once again stuff my face with all things sugar. These were little pastel coloured sticks that looked and tasted a bit like chalk. As far as I know they have now gone out of production. Funny that. They cost about 3p and I would often spend all of my pocket money on them. There doesn't seem to be any pictures of them around but you can join a Facebook page called 'Whatever-happened-to-Fizzle-Sticks'? A quarter of. White or yellow - but never the pink strawberry ones. They're a classic, just not sure my teeth would hold up to them now. In primary school our head mistress used to let us put our bony fingers into one of those huge tubs as a prize for being good. We could eat as many as we could manage to pick up with one hand. It was always five. These were packets of boiled sweets that came in different flavours. My favourite were the sour cherry ones that you sucked like an old lady until they cut the roof of your mouth. I used to get these every Saturday morning from the shop down the road. In fact most of these sweets came from that shop. Unfortunately it was located right opposite our dentist, who used to tell my mother how many times I'd been in that week. I would destroy my remaining teeth with them lying on the sitting room floor in front of Tiz Woz (I'm showing my age here aren't I?). 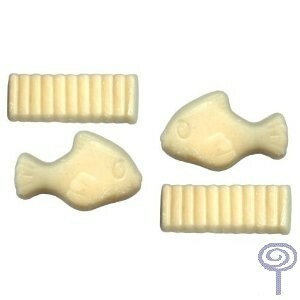 These were white chocolate sweets that you could buy individually for a few pence. As a teenager I used to pop home from school for lunch and return laden down with these on order from most of the class. There are so many more that nearly made the list - but I'll leave them to you to rediscover. 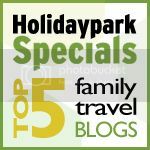 All you need to do now is write your own list on your own blog and then come back and leave your details in the linky below. The world is conspiring against me. I gave up sweets for Lent. I am at Starbucks and what do they have? Red velvet whoopie pies. Like cupcakes but better. And now this post. Sniff. Damn you. 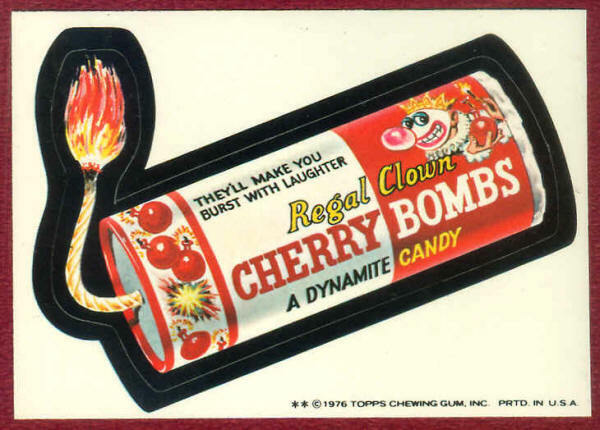 Haha, cherry bombs were good stuff. I tried them first in India (where apparently they're behind the times on candy) but then I could never find them in the States! Thanks Kate! So much fun! The Fish and Chips look yummy. Managed to get my act together enough to join in this week Kate! I love bon bon, don't you just love it when you find a really oldy worldy sweet shop where all these sweet are still being sold yummy! I have added mine to my blog, and I am losing my 'no sweets' resolve. Ooh, hello you've had a blog makeover! Verrrrry nice. LOVE the fab new look!! Ooh haven't even heard of a couple of them and never saw those Fish n chips! I remember some chalky sticks called Swizzle Sticks - are they the same thing? Fab listography choice, couldn't resist it! I am a sweet addict! ChocOrange - with a name like that I'd never have guess it! I've never heard of any of these! But where are the good old cinnamon bears, red vines, candy cigs (true Americana!) and swedish fish?! Bon bons were lovely and so were fish and chips. We have an old fashioned style sweet shop in town with all the jars lining the shelves. Very nostalgic and fattening! yellow bon bons were seriously delish, but seem to remember them tasting a bit rank at the end, when they got to the sticky bit. 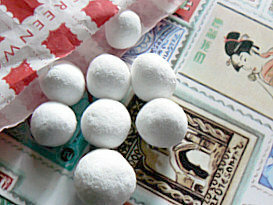 A bit like those silver balls that had that horrible aniseed bit in the middle. Love the new site by the way. What a lovely idea for a linky - I just remember little plastic bags full of pink American Cream Soda powder and fish and chips - no more come to mind really. 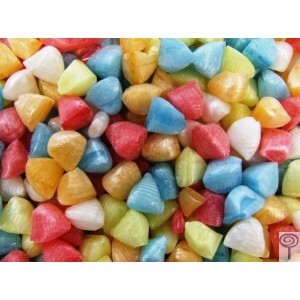 I love bon bons I would even eat the pink ones if they were offered up to me! Mine's posted. Great to see someone else mention American Cream Soda! You're a woman after my own heart. I blogged about the demise of proper sweet shops recently - bring back pink sugar mice I say!!! I'm hungry for sweets now!! I had fish and chips the other day!! Spotted them in a pick n mix place and couldn't resist! I love this list Kate, sweeties are one of my great loves. Actually most of my great loves are edible.